In bulk material handling facilities and systems, vibratory feeders are often used at various stages to convey and sort particles. Vibratory feeders are particularly useful for delicate or sticky materials because they can convey them without causing damage or causing them to liquefy. Vibration in a vibratory feeder is caused by a vibrating drive that is installed beneath the bowl or feeder. It is out of the way so that it does not come in contact with bulk materials and cause contamination. Vibratory feeders are sometimes called vibratory conveyors, and they can be divided into two main categories: vibratory bowl feeders and vibratory conveyors. The first type, bowl feeders, are used more for parts than for bulk material. Essentially they can align products before packaging so that they are discharged into the package in the right position. 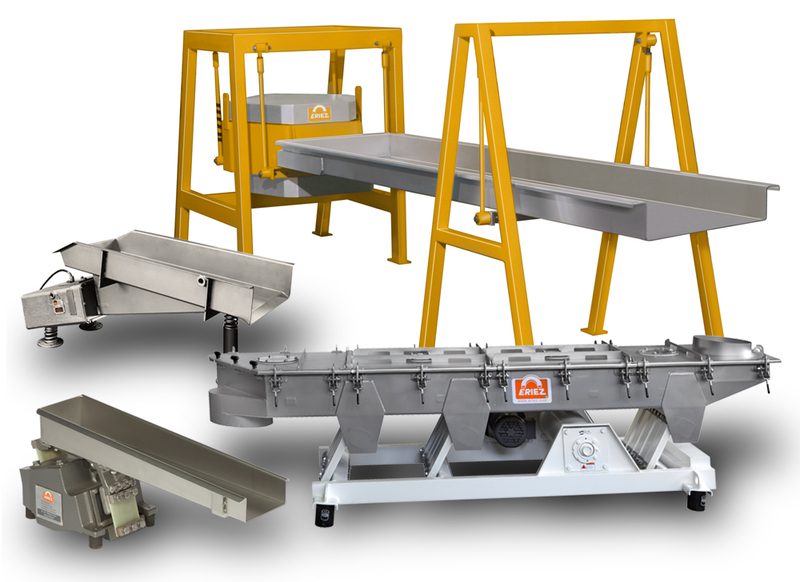 Vibratory conveyors are more important to bulk material handling systems and they are manufactured in a wide range of types. Some are built with troughs that sift material, while others have vibrating or trommel screens to convey and sort bulk products simultaneously. Rotary feeders are in another category altogether. These can feed material from one point in a system to the next through an airtight valve. Often a rotary feed is used to feed materials from a tube or silo into a vibratory conveyor at a predictable rate. In applications where bulk powder is being handled, vibratory conveyors with screens and trommels are used to sort particles and process them before packaging. This is particularly important in agriculture and food processing. Mining operations use grizzly screens, a powerful and heavy duty type of vibrating screen that can sort heavy materials like rock. 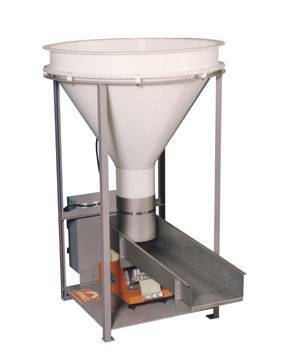 Bulk solids or powders are conveyed on a vibratory conveyor through a series of metal troughs. Sometimes the machine is designed to operate with low-frequency vibrations so that the bulk material is not damaged or broken up too much. Bulk material handlers use vibratory feeders in their facilities for a number of reasons. First of all, feeders can be operated by just one person who monitors the machines to make sure they are running properly. This reduces labor costs and allows for more bulk material to be processed per hour. For delicate or difficult bulk powders or solids that cannot withstand pneumatic conveying, vibratory feeders are the perfect solution. Vibratory feeders are manufactured in many different sizes to meet the needs of large and small facilities. The many different models that are available make it possible for large and small bulk handling facilities to integrate these machines into their systems and use them in conjunction with other bulk handling equipment. Whether the feeder is being supplied by a rotary airlock or some other source, the flow should be calibrated correctly so that the optimal volume of material is being released without introducing too much media into the screen. An additional benefit of vibratory feeders is that they are very easy to maintain and require only minimal maintenance. In an application where the feeder will be processing tons of bulk material per day, this is extremely important. The simple design of most vibratory feeders and the absence of mechanical parts make it easy for them to run for extended periods of time without ever encountering an issue. Industries that rely on vibratory feeders in their bulk handling systems include: agriculture, pharmaceuticals, and food processing.